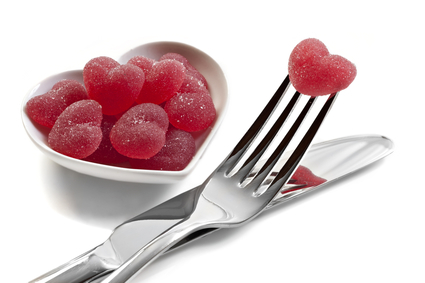 Is Sugar Hurting Your Heart? For many years the popular belief has been that diets high in fat were causing increases in rates of heart disease among men and women. New studies have since shown that fats found in foods such as avocadoes, olive oil and nuts, help to protect against heart disease and the sugar found in our diet is the real contributor to increased heart disease risk. A study of more than 40,000 people, published in JAMA Internal Medicine, showed that people who had the highest sugar intake had a four-fold increase in their risk of heart attacks as compared to people with the lowest sugar intake. The study revealed that even consuming what was considered to be moderate levels of sugar, 10% - 25% of daily calories, lead to a 30% higher risk of developing heart disease. The Heart and Stroke Foundation is now recommending that our daily intake of sugar be no more than 10% and ideally, less than 5% of daily calories. This is equivalent to 25 grams (5 teaspoons) for someone eating 2,000 calories a day. However, over 70% of adults are actually getting between 10% and 25% of their daily calories from added sugar. Reducing the amount of sugar should be a high priority for everyone. Reading food labels to identify high sugar items and eating a diet of whole unprocessed foods may significantly lower your risk for developing heart disease and your chance of having a heart attack.